Every year I select one book that I designate as the best book that I read that year. This year that book will probably be, The Awakening by Donna Boyd. This book has challenged me to think differently about life, death, and freewill. I read a lot of books, personally and professionally, this level of praise from me is rare, but this book is a rare find and earned every word of it. The Awakening is set in a lakeside home in Mercy, North Carolina. The novel has two stories. One is the story of Penny and Paul Mason and their troubled thirteen-year old daughter, Elsie. After Paul, a one book bestselling children's author and college professor, is fired for having an affair with a student, he moves to the lake house to try to rebuild the summer home and with hopes of rebuilding his marriage. Penny, a surgeon and now sole breadwinner in the family, seems interested in the salvage projects, but is forced to spend long hours tied to her practice and city apartment. As the family members struggle to keep it all together, Elsie seems to be slipping deeper into a world filled with strange visions and voices. Meanwhile in a second plot, a woman awakes in a sanitarium from a coma resulting from a trauma that has robbed her of her family and her memory. Working with a psychiatrist named Michael, the woman is permitted to return home only after she remembers that her name is "Mary". Her return home is however far from the comfortable joy she expected. Her home and her family - if these strangers are her family - are much different. Mary, like Elsie, is also suffering from strange visions and voices, but she chalks it up to her trauma. Too reveal much more about the story is to reveal too much, and to deprive the reader of the many "aha" experiences throughout the book. What makes this novel so extraordinary is its challenge to the standard views about death. It raises the very intriguing question - is there freewill after death? If so, what are the dead free to do? What limitations would they have? Most people, I would guess, if given freewill after death would not choose to move on to…whatever, but would rather return and be near their loved ones. So, what would encourage them to abandon this world and to "cross over" to the next? If the concepts of freewill and death seem like an oxymoron then I am with you, but then I read this book and it made me re-evaluate the topic. If there is freewill in life, why not the possibility of freewill beyond life? "Donna Boyd" is the pseudonym for Donna Ball, who also writes as, Rebecca Flanders, Donna Carlyle, Leigh Bristol and Taylor Brady. Her first book, Winners (St. Martin's Press), was serialized in Good Housekeeping magazine and was published in 1982. As Donna Boyd, she has previously published two novels about werewolf The Passion (1999) and The Promise (2000), and another metaphysical book entitled, The Alchemist (2002). Ball/Boyd lives in North Georgia on the land they purchased from the Cherokee in 1782. The Awakening is her fourth title published as Donna Boyd. 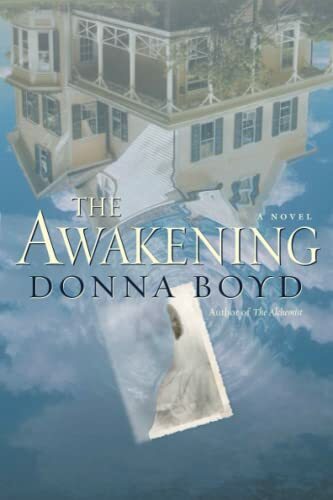 The Awakening by Donna Boyd will give the reader a lot to think about and for those who do not wish to think, it is an excellent ghost story. I HIGHLY recommend this book.